One of the biggest trends in skincare, Gua Sha is an ancient form of therapy which uses a stone to increase blood flow and release fluid stagnation in the muscles. Specifically, Gua Sha facials melt away muscle tension and drain lymph for defined cheekbones and sculpted jawline. Experiencing a Gua Sha facial at the Beauty Bungalow is a must! See why Florida Beauty Problems calls our Gua Sha facial, “the grooviest new treatment in skincare” in their recent feature. Just Launched: we now carry an assortment of gorgeous Gua Sha stones for home care! Similar to it’s big sister we use in the spa, the at home stones are pocket sized and a perfect fit for your makeup bag. They’re lightweight, travel-friendly, and safe for all skin-types with no sharp angles or edges. No matter which way you turn, twist or glide the stone, it will provide results. These will elevate your self-care skincare ritual to the next level… find them in our spa shop! 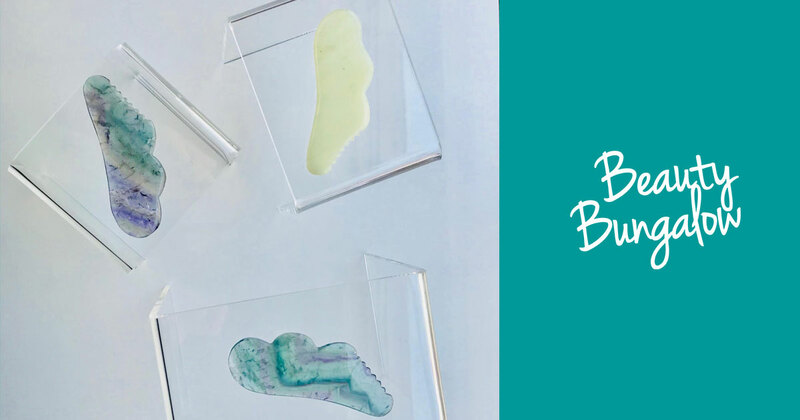 If you haven’t already experienced a Gua Sha Facial at the Beauty Bungalow, call us or click here to schedule.